This isn’t a new novel. Grisham penned this 15-years ago, but his work stands easily against the winds and fortunes of time. That’s the best thing about great literature, it may get bumped to the back of the bus, but the best stories last forever. If you are going to read a good book, a Kindle device is your BFF because it can bring a new companion at a moment’s notice and let you drift away with the melody of the author. 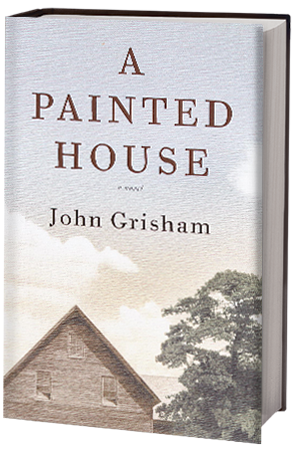 Grisham’s A Painted House is set in the early 1950’s with a backdrop of good weather, good crops, and a good chance that Luke Chandler, all of seven years old, and his family, will make it through another year of farming to put away enough preserves and cash to last the winter. The arrival of migrant workers turns the story from innocence to agony for Luke, but he’s at an impressionable age. So am I, as I greedily take in every word with a hunger for more. The story is small, the farm is too, and Luke matches it all while still growing into a young adult, and at the same time, this isn’t a young-adult book. It’s a full package. It’s a perfect match of good and evil to suit me and I was devastated when the story ended. Not by the ending, only by the fact that it did end. The funny thing about this book is that there isn’t much of a plot. There isn’t really a long-winded story, either. This is a complete time capsule. It’s a story about a young man’s life. I won’t give anything else away, but there are scenes and subtle references that prove he took some of that time in his life with him to his 30’s and then transposed them to our lives with the magic of a novel. If you are looking for a fast-paced, action thriller, this ain’t it. This is a story – beautifully told, about a time I’ve only heard references to, but he blends it well, and there are even baseball events that piqued my interest. What it lacks in pacing and thrills, it makes up for in quality. The writing is wonderful. The ending was slightly disappointing and stunted.